As Orange County's trusted provider of expert spa and hot tub repair services, Spa-Tech Spa Repair is known for our skilled factory-trained and certified technicians and their ability to handle almost every kind of above ground and portable spa repair job. Our services include spa retrofitting and upgrades, as well as repair of spa and hot tub parts, including controls, pumps, motors, circuit boards, heaters, air blowers, lights, air buttons, filters, jets, timers, and plumbing. 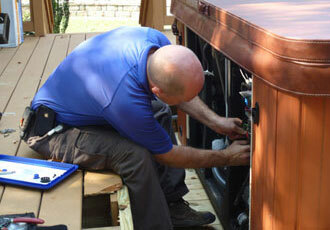 We perform leak repairs for above ground spas. (In-ground spa leaks are referred out to a qualified in-ground spa technician.) Spa-Tech Spa Repair is a certified factory service center for all of the major spa and hot tub brands, including Sundance Spas, Jacuzzi Premium Spas, Coleman Spas, Freeflow Spas, Artesian Spas, Maax Spas, and more. For a full list, see our page of brand names we are qualified to service. With almost 40,000 clients served throughout Orange County, our technicians are highly qualified to meet your spa and hot tub repair needs. We stay up-to-date on all the latest trainings and spa repair techniques, and are committed to building long-term relationships with our Orange County clients. To ensure that we provide you the best possible service, please have the make and model of your spa available. Since we stock our own warehouse, we are able to source hard-to-find parts for our customers, and we use only high-quality, genuine factory parts. For expert spa and hot tub repair service, call Spa-Tech Spa Repair today. We've been serving Orange County residential spa owners for over two decades, and provide high-quality service at a competitive rate. Spa-Tech should be the only place anyone needs to call for Spa services. Jim is a very knowledgeable technician and extremely honest which you don't find too many of these days. He diagnosed the problem(s) with the spa within 10 minutes and advised what needed to replaced. Best thing was that he had all the parts available in the truck . . .